I wasn’t entirely convinced by the blurb; this isn’t the kind of book I’d usually go for but I’d really enjoyed Laurie Graham’s “Life According to Lubka” and abandoned my prejudices long enough to whiz through “Perfect Meringues” in a couple of hours. This is non-challenging, easy to read, frothy and funny stuff but to leave it at that would be to do a disservice. Graham’s spoof of daytime television is sharp and funny, with just the right level of affectionate lampooning. I particularly loved the bizarre juxtaposing of items in the show’s running order with ‘Yuppy Flu’ followed by ‘Taking the Fear out of Fish’, and on another day Lizzie is less than delighted to be squeezed between “Romanian Orphans” and “The Health Hazards of Keeping a Dog”. 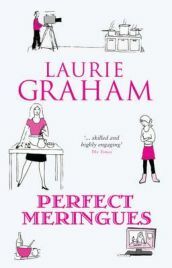 I was reminded of the way that Victoria Wood is able to highlight the funny side of some our best loved institutions but always manages to stop just short of cruel; no need to alienate your readership after all and I’m guessing that this book or others by Laurie Graham could easily make it onto Richard and Judy’s reading list. In fact the characters are very much in the Victoria Wood vein and if you like her material, it’s a safe bet you’ll enjoy Laurie Graham. The story is pretty weak but the throwaway lines pretty much mask that. On her image consultant sister-in-law: “Yvonne’s got a touch of jaundice. She was propped up in an eau-de-Nil nightie, so much for colour counselling”. Imagine a middle-aged, witty Bridget Jones and you’re close to Lizzie Partridge. Mothers of teenagers will recognise their own offspring in the gloriously petulant Eleanor but as a confirmed ‘dinky’ I would have loved Eleanor to have once or twice trumped Lizzie with a killer line. There’s a pronounced dark edge to Perfect Meringues; just when I was finding some of the more comical characters too one dimensional and unoriginal, Graham slips in a few surprises that really shake up the story but ultimately the story jumps around too much and some interesting ideas are abandoned in favour of “scarlet satin and Lycra catsuits with acrylic ermine trim”. That there wasn’t really a plot didn’t occur to me until I’d finished; in fact the 230 pages flew by in a haze of failed dates, bitchy aerobics trainers and sulky teenagers. The comedy is superb and acutely observed and the pace is lively but Perfect Meringues reads more like a series of comedy sketches than a coherent novel and the situations are just too predictable in spite of a couple of curve balls. While I found plenty to enjoy it wasn’t in the confessions of a middle-aged mother of a teenage nightmare, an ex-husband about to marry a woman almost young enough to be his daughter, and the trials and tribulations of dating later in life. Personally the characters are my idea of a cure for insomnia; fortunately Laurie Graham’s ear for humorous dialogue and talent for pinning down the funny side of everyday life saves the day. I’m probably not the target audience for this particular novel but I did find it very funny and it certainly didn’t put me off reading any more of her novels. It’s not a patch on “Life According to Lubka” but it’s not bad either. No Comments on "Perfect Meringues"